But connectivity also plays a larger, global role — one that links communities, economies, and countries through transport, trade, communications, energy, and water networks. In this broader form, it’s known as global infrastructure connectivity, and it boasts a special super power: the ability to catalyze infrastructure development. Well-planned and interconnected infrastructure can lead to higher productivity, greater gains in service efficiency, and increased investments. Another benefit of interconnectivity? A more vibrant trade sector bolstered by transport logistics that leverage efficiency-boosting technologies. The advantages of strengthening infrastructure connectivity have caught the attention of national governments, international organizations, and other international stakeholders — including the G20. Over the past 20 years, the international community has embraced the role of infrastructure connectivity in supporting sustainable development and expanding shared prosperity. As a result, infrastructure connectivity has emerged as a key priority for policymakers and practitioners across the globe. The increasing interest in infrastructure connectivity has spurred demand for economic corridors, cross-border investment programs, trade and logistics observatories, and regional bodies dedicated to promote connectivity and regional integration. Nonetheless, progress has lagged behind expectations. One big reason? While experts working in infrastructure-related sectors produce a constant, rich flow of connectivity-focused resources, this knowledge is most often shared at a regional or thematic level, with limited opportunities for comparisons across regions or sectors. And without a readily accessible, web-based platform to capture and share the most relevant knowledge, policymakers and practitioners have faced an additional roadblock to developing projects designed to boost infrastructure connectivity. The G20 stepped in with a solution. Recognizing an opportunity to close the gap in availability of current and relevant resources, the G20 launched the Global Infrastructure Connectivity Alliance (GICA) in July 2016, with the World Bank Group as its Secretariat. Pronounced “jee-ka,” GICA supports infrastructure connectivity by working across regions, disciplines, and the Bank’s Global Practices to promote cooperation, knowledge exchange, and meaningful progress in global interconnectivity. Hosted by the World Bank Hub for Infrastructure and Urban Development in Singapore, the GICA Secretariat collaborates closely with its members, including the Global Infrastructure Hub, the OECD, multilateral development banks, international organizations, UN organizations, and interested countries. In support of the G20’s mandate to increase accessibility of connectivity-related knowledge, GICA has created an online Resource Library — a one-stop repository of key content on infrastructure connectivity — where policymakers and practitioners (and others) can search and mine the knowledge, tools, and best practices essential for developing and implementing infrastructure connectivity projects. 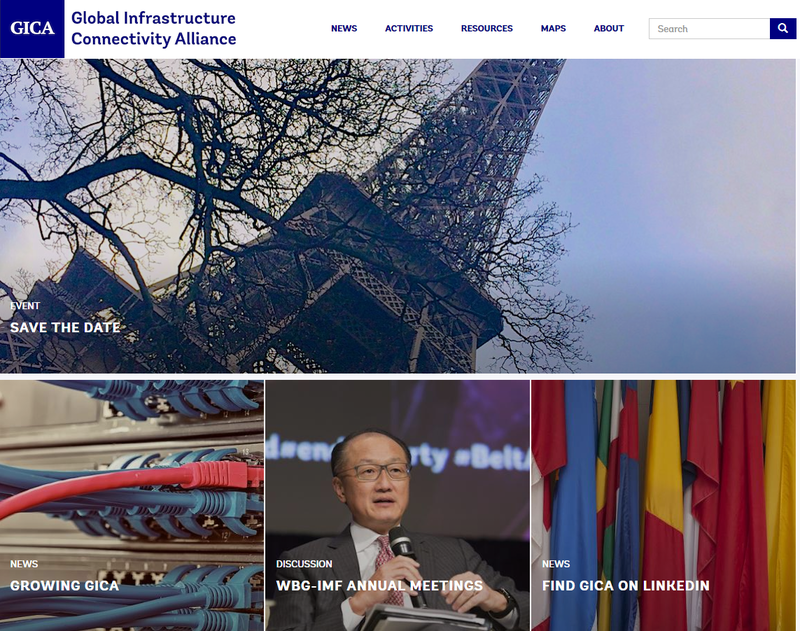 Check out GICA’s brand new website to learn more about GICA and global infrastructure connectivity, browse the Resource Library, and explore membership or other opportunities to participate in GICA activities. Along with launching a website, GICA’s online presence extends to LinkedIn, where GICA members and like-minded professionals can engage and share knowledge. Join GICA’s LinkedIn Group to connect with others working in infrastructure connectivity and to participate in online discussions. Later this month, GICA will host its first Annual Meeting in Paris, co-organized by GICA, the World Bank, and the OECD. A forum for GICA members to share their latest research and findings and define new areas of cooperation based on identified gaps, the invitation-only event brings together policymakers and practitioners participating in GICA to discuss the state of play in global connectivity, innovative practices, and the outlook for connectivity. We welcome policymakers and practitioners working in the field of infrastructure connectivity to register their interest in attending. Read more World Bank blogs. The World Bank has two ambitious goals: End extreme poverty within a generation and boost shared prosperity. World of Opportunity brings you stories from the World Bank about climate, data, entrepreneurship, gender, health, ICT, innovation, migration, and more. Learn how the World Bank is working to end poverty and create opportunity for all.